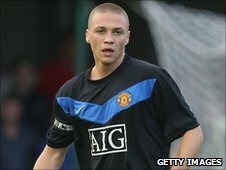 Carlisle United have agreed a loan deal for Manchester United defender James Chester until 31 December. Chester, 21, was made captain of the Red Devils' reserve side in 2008/09 and has made one first-team appearance. Carlisle boss Greg Abbott told BBC Radio Cumbria: "He's a good defender, very mobile and comfortable on the ball as well. "He's certainly got a calmness on the ball that will help us. We're delighted to have him here." Warrington-born Chester impressed in Sunday's 1-0 friendly defeat of Hibernian and Carlisle were quick to agree terms with United to capture his services. Last season Chester spent a month with Championship side Plymouth, making three appearances before injury prematurely ended his loan stay at Home Park. He also played a part in Peterborough's League One promotion campaign in 2008-09, featuring five times for manager Darren Ferguson. Chester said: "While I'm under contract at Manchester United there is always that hope to be a first-team player there. "To get six months of regular League football at Carlisle then there might be other other opportunities at the end of this." The addition of Chester has ended Carlisle's interest in Sunderland defender Jean Yves M'Voto after the two parties were unable to agree terms.